Learn how to sew anything that needs sewing and love it! If you have never held a needle and thread or threaded a sewing machine, the idea of learning how to sew anything can seem overwhelming. It doesn't have to be. The first step is to allow yourself a little bit of time to find the basic information you need, then take a deep breath, relax and then start enjoying how much sewing increases your sense of accomplishment and creativity, to say nothing of the amount of money you will save by knowing how to sew your own mending, repairs and sew things from scratch. No one knows everything when they start a new project, so allow yourself to learn sewing one step at a time and develop your sewing skills as you go. The idea is to enjoy your new hobby and develop skills at your own pace while accomplishing something in the process. Vocabulary can be one of the biggest barriers to learning any new skill and learning how to sew is no different. A sewing glossary is a great thing to bookmark so you can refer to it anytime you run across a word or a term you don't understand while you learn how to sew. Visit this Sewing Glossary and bookmark it for future reference. Did you know you can "sew" fabric and other textiles, without ever threading a needle or even having a needle and thread on hand? No sew sewing is achieved with the fusible that will join two pieces of textiles with a fusible material that requires heat to "glue" the two pieces together. Fusibles are a way to mend tears that are bound to show no matter what type of stitching you try to use. Fusibles are a great way to hem a garment without having any stitching showing and to have a hemmed garment in a hurry. Fusibles are one solution to never threading a needle but I'm not sure we'd trust an entire garment that was constructed with a fusible. Eventually, you will want to sew and be creative, which will lead to you learning about needles and thread. Hand sewing is one option that is an economical choice to get started. Time and patience can sew an entire garment or item by hand. Everyone should learn to sew even if your sewing skills never surpass learning to do simple mending projects. No one wants to buy a whole new shirt just because a button came off the shirt. Perhaps the thread broke in a seam. Anyway, you look at it a simple mending job is much less expensive than shopping for and buying a whole new item. Button Pins- A no-sew way to hold a button in place. Any job, not just sewing, is easier if you have the correct tool for the job. Gaining a good supply of sewing tools don't have to break the bank. A pair of scissors from a dollar store can go a long way to get you started if you never cut a piece of papers with those scissors. 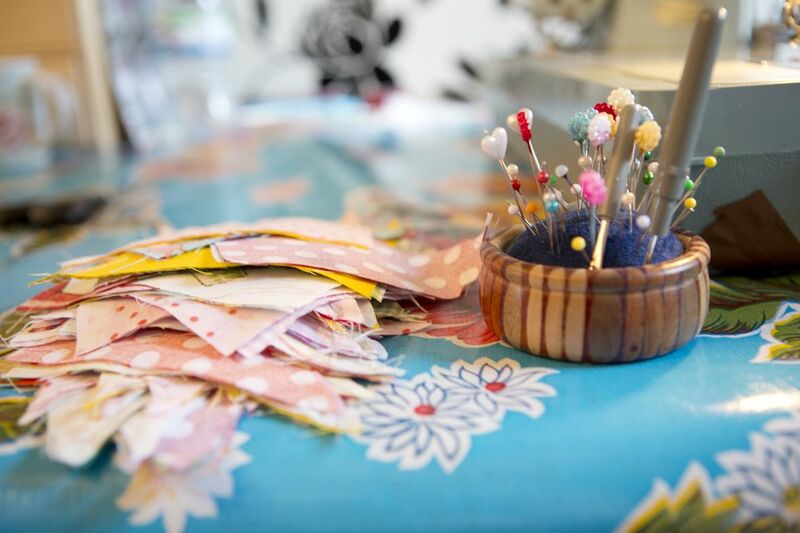 There are many ways to save money by sewing and those tips and tricks can be applied to accumulating a wonderful sewing box full of the best sewing equipment available. It is rare for someone to realize just how much fabric surrounds them and affects their daily life. Most people think about the clothes that cover their body, the sheets and blankets on their bed and the linens in their bathroom. You sit on a chair or sofa and don't stop to think about the fabric that is sewn together to make that furniture comfortable. The window covering is usually thought of as curtains or drapes, but the fabric that makes them up is rarely thought about on its own merit. Clothing and other fabric items have unseen elements that lend stiffness or support to the main item. Facings usually have a form of interfacing to hold the faced area in place and add body to the area. Comforters and other insulated items, usually have a form of batting inside to provide the insulating value. The lining is an important part of many garments but rarely do people think about the lining fabric and how it got in place. The fabric has different qualities that need to be taken into consideration when you go to lay out a pattern. If you've ever had a pair of pants, that the leg wanted to wrap around your leg, you have experienced an item that was not cut out on the straight grain of the fabric. Learning about fabric qualities will help you make educated choices at the fabric store and choices that are appropriate for the item you want to make. Eventually, most people graduate to wanting their own sewing machine. Almost everyone has a sewing machine that has been passed down through generations.. and probably hasn't been used for a couple of generations... or they have a sewing machine that was found at a yard sale or thrift store. Whatever the story behind your sewing machine, you need to have the manual to your sewing machine. That manual will help you solve problems when they surface and prevent hours or frustration. Is There a Difference In Threads? You Be The Judge! Seams are the basic sewing that holds two or more pieces of fabric together. Most people will learn basic sewing before they dive into using special seam techniques and experimenting with diffident ways of approaching a sewing project. Learning about sewing seams and special seams will increase the way you develop your own style and create what you have in mind. Learning to sew seam finishes will assure you that your garments are going to be strong and last through extensive laundering. There are and projects that are easy and accomplishable! If you want to sew, you will eventually want to experiment with commercial sewing patterns. In years gone by the option was to spend a day at the fabric store, browsing through pattern catalogs to find a pattern that was exactly what you had in mind... or one close enough because you couldn't spend any more time at the store. The Internet has opened a whole new ease at searching for the perfect commercial sewing pattern. For your first endeavor at sewing with a commercial sewing pattern, you may want to follow along with a free step by step sewing lesson which explains every step of the process with a particular pattern. Many people have or had a relative that knew how to sew but are unable to ask the questions they wish they could ask. Don't despair! We have a Sewing Forum which is free and is shared with people who want to share their experience and help others learn the hobby they love... sewing! Registration is free. We request that you register so that we can limit the amount of spam.